The maple leaf ~ a vibrant national symbol endearing to the hearts of all Canadians. It’s on our flag; we tap the syrup of the maple tree and slather it on pancakes or make fudge with it, or maple butter. Yum! It’s image festoons pretty much all Canadian tourism merchandise. It’s the standard for our national airline. Oh yes, and at this time of year we spend countless backbreaking hours raking up their fallen legions in preparation for the invasion of winter. I am disappointed to see that this past summer a neighbour behind our house removed a huge old maple that had been glorifying their back garden. It had probably been there for about two hundred years ~ a witness to all the changes that have occurred in this area since the town was founded about 150 years ago. Perhaps it was a nuisance to clean up after it. Perhaps it was sick or had been compromised by last winter’s devastating ice storm. It doesn’t matter why it’s gone, I just miss being able to look through my bedroom window to witness its impressive canopy dissolve from green to orange as temperatures drop through the early fall, and then see it come to life again as spring makes its welcome return. 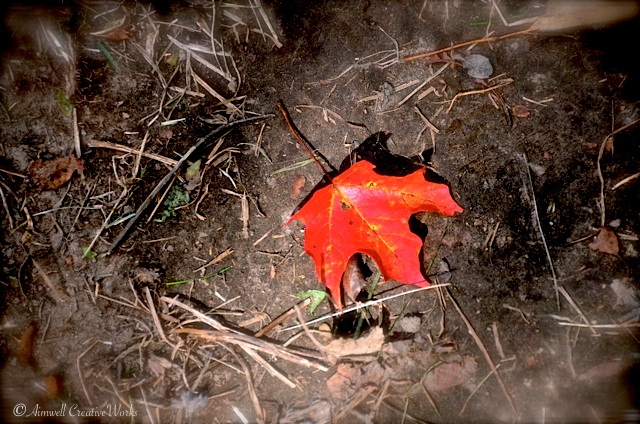 Still, fallen or not, the maple leaf shall live in my heart forever. This entry was posted in Canada, Nature, Photography, Uncategorized and tagged Aimwell CreativeWorks, Autumn, Dorothy Chiotti, Light and shadow, maple leaf, maple tree, Ontario, Photography, Weather. Bookmark the permalink.